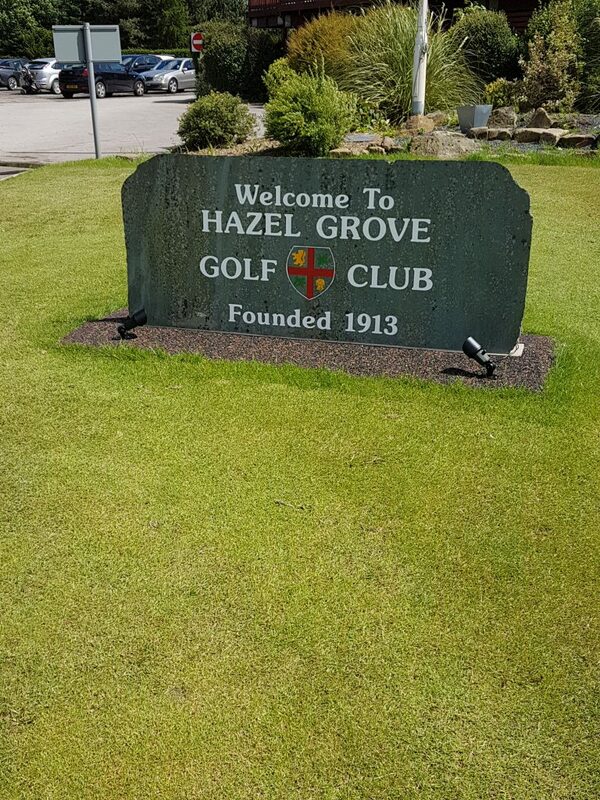 Hazel Grove Golf Club was founded in 1913, its modest first site being fields rented from a farmer near Manchester. A couple of moves in quick succession to new locations followed and by the early 1920s finances were raised and the club embarked on the improvement and preconstruction of the course by Mackenzie & Nicholson Golf Course Contractors. The next major work to be carried out on the course took place in 1990 when plans for the infamous A6 bypass resulted in the compulsory purchase of a section of the old course which, to this day, remains unused. However, this land continues to be maintained by the greens’ staff as if it were still part of the course and makes an excellent practice area. New land was acquired and the course was redesigned along with a complete refurbishment of the clubhouse and its facilities. However, the greatest feature of the new course is probably the greens, having all been relaid to USGA standards. Not only does the club state it arguably possesses the best greens in the region, but members and guests can also enjoy playing on them for 12 months of the year without a temporary green in sight. 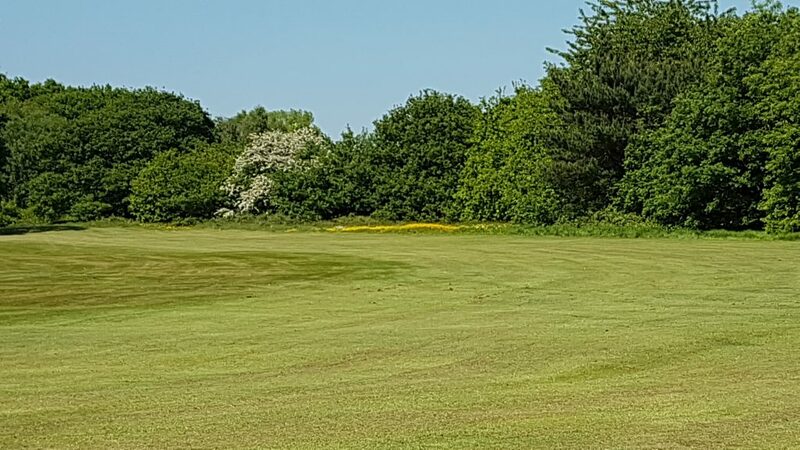 GreenKeeping spoke to the club’s course manager, Mike Davie, to find out about the challenges involved in maintaing this venue. 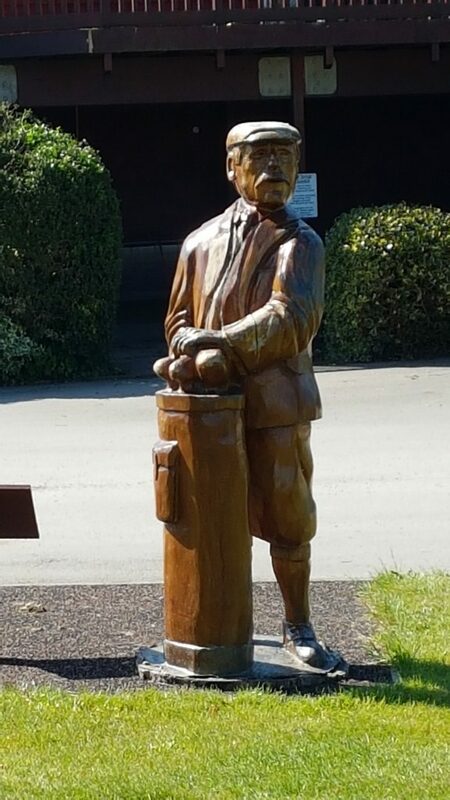 How did you become the head greenkeeper at Hazel Grove? I took up golf in 1975 and turned assistant pro in December 1977 at Abbeydale GC in Sheffield. I decided to go down the greenkeeping route and went to Lancashire College Agriculture / Horticulture at Myerscough for a three year course in turf and recreation provisions. I became head greenkeeper in 1984 at Ashton and Lea in Preston. Joined Hazel Grove in January 1991 as head greenkeeper and last year I completed my 28th summer. What are the biggest challenges you currently face in your role? Meeting the expectations of the current generation of golfers in lowering budgets and staffing levels, possibly due to televised golf. I try to communicate with golfers via reports and bulletins – but I’m not always successful. The inconsistency of the climate, which keeps changing, also causes issues by increasing expectations. What does your current team number? In 2007 staffing levels were the head greenkeeper (me), my deputy, five qualified staff, one trainee, one seasonal worker and a government scheme worker with learning difficulties. In 2018 it’s the head greenkeeper, my deputy, two apprentices on a scheme who are both under 20, a seasonal worker and a guy with learning difficulties who has been with us 22 years. After training, all tasks are undertaken by all, where qualifications allow. Given the lack of staff compared to 11 years ago, how are you maintaining such a high performance from them? I work on a system where I want the team to work for their pride and for me, not out of fear. I don’t do iron fist tactics – a happy team is a productive team. All are encouraged to contribute and notice and report problems around the course to aid their development. 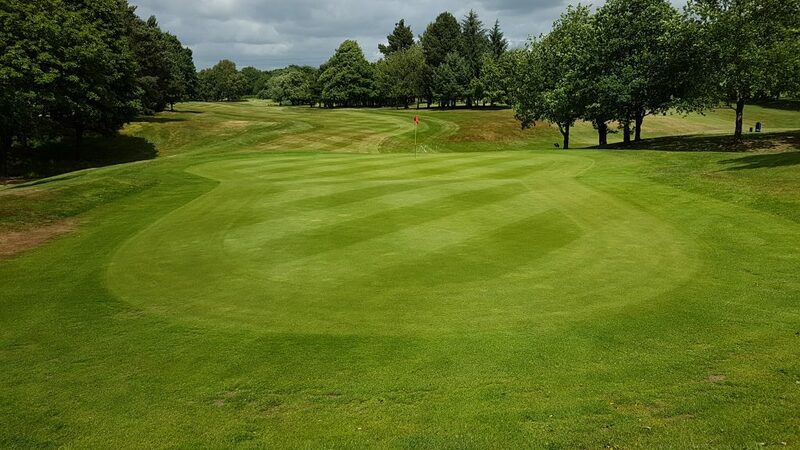 The daily working life of a course manager and members of a greenkeeping team are demanding enough as it is, without the added weight of members’ expectations, which you’ve said keeps growing. Mental health in greenkeeping is a real issue and you have recognised this and are blazing a trail to deal with this serious matter. Please can you outline your observations and explain what you are doing to help support those who may derive benefit from your initiative? Over the years I have observed the increase of expectations of the golfer with increased personal abuse and stress among the greenkeeping community. I have had friends get out of the industry due to such problems and know of many more who have also left. Mental health issues are more apparent nowadays as more seek medical help. Yet little support is offered from many golf clubs and duty of care is apparently not seen as a necessity. 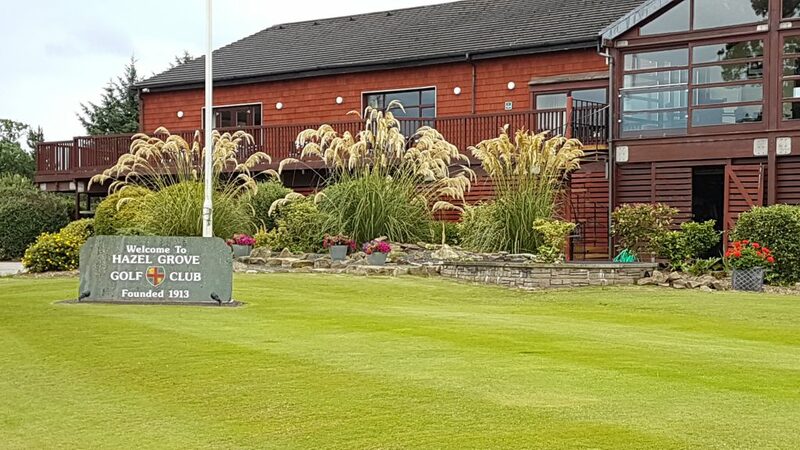 One of the problems is that clubs are run by well-meaning volunteers, which means when they need to discipline members for acts against the club’s staff, they don’t want a confrontation with their ‘friends‘ and would rather brush the matter under the table and resolve the issue by providing a polite pat on the head of the greenkeeper. This all creates a feeling of isolation within the industry. Any sign of acknowledging a problem by oneself is deemed as thought of being weak, so we tend to bottle it up, causing greater problems. In late 2017 I attended a stress awareness seminar by BIGGA at Sale Golf Club and realised that, by the number who had attended, and the fact that many are highly respected within the industry, we had a problem with mental welfare. I started a local support group in south Manchester for greenkeepers who wished to attend and talk out their problems. The realisation that we are not alone made a huge difference. The feedback I got was positive so a Facebook page, ‘Greenkeepers mental health support group’, was started in late July of last year. We now have in excess of 220 members. This group does not always need people to comment but, as I have been told, the fact there is a page that can be accessed gives strength to someone feeling down. A big problem with our industry is that it is a high percentage negative industry. For example, you lie in bed listening to the rain, wondering how the course is affected. Will there be breakdowns, will all the staff turn up? The first thought of seeing committee member is ‘what’s their complaint?’ and so on. These sites help to promote the fact we are not alone and in fact are a strong community we just need to tap in, build bridges and connect more. In the long term I hope that the governing bodies will take on the challenge of promoting, supporting and giving help to the welfare of greenkeepers. 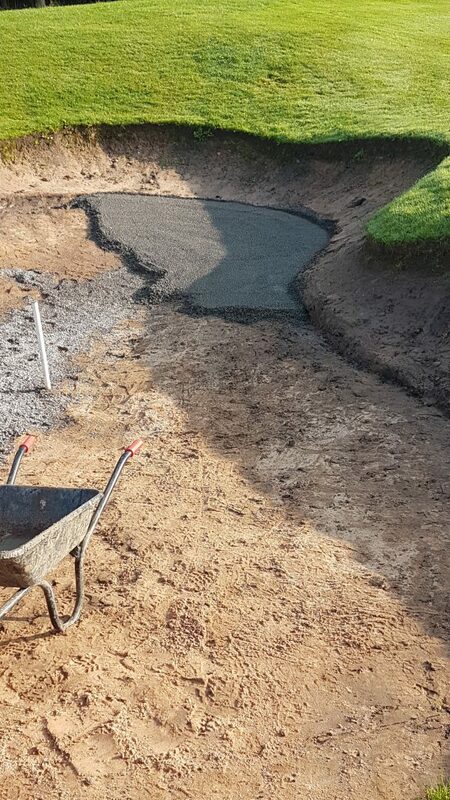 The course has circa 40 bunkers and you and the team have started a refurbishment programme. What problems were you experiencing with the bunkers and how did this affect the maintenance programme and how did it impact on the course and the members’ play? The course is on heavy clay and following an extensive bunker reshaping exercise in 2002 it was evident we had a massive wash down problem. The bunkers were continually full of water and there was a contamination problem. They were frequently out of play and in some winters we had GUR for four months! Members were quite rightly unhappy, so a liner was sought. What set of criteria did you use to select the bunker liner? 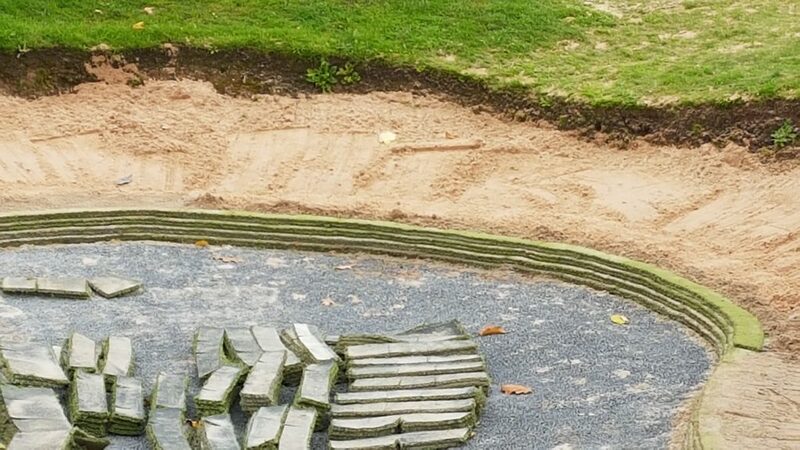 Following research by the committee it was decided that we would reshape some of the bigger bunkers and remove the faces to reduce wash down. We decided on the Capillary Concrete system as trials proved very successful: no contamination of sand and no flooding in the bunker. These bunkers required less maintenance and so, long term, all bunkers will be easier to maintain. 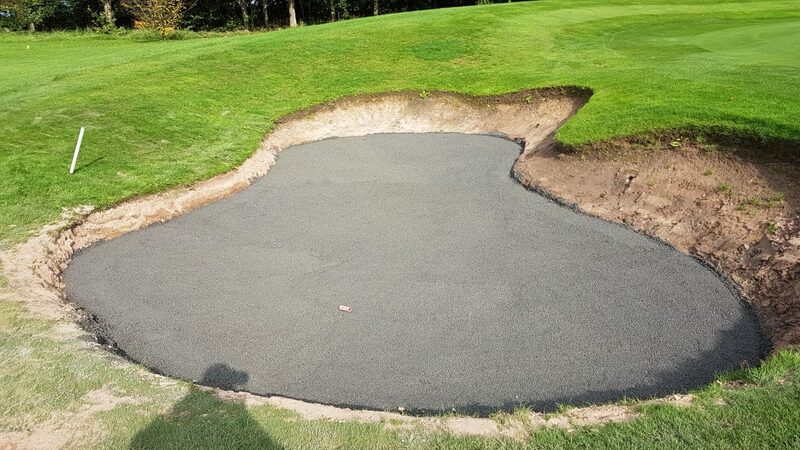 You’ve done the work in-house, how many bunkers have you completed, how many will you be doing over what timeframe and how easy have you and the team found Capillary Concrete to install? 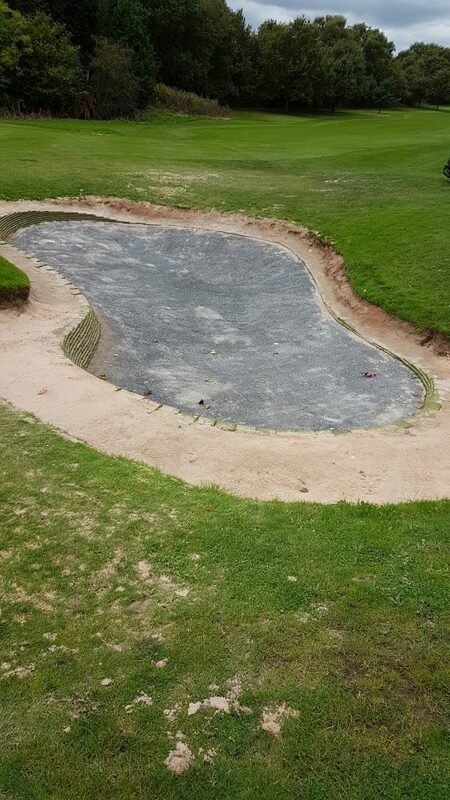 Following guidance and support from Neil Thompson of Border Sports and training in the installation of Capillary Concrete, we have completed eight bunkers. This was done with minimal effort and as always it’s the preparation that is the key to success. The aim is to complete all bunkers earmarked for this process, currently 20-plus, over a three-year period as our budget dictates. 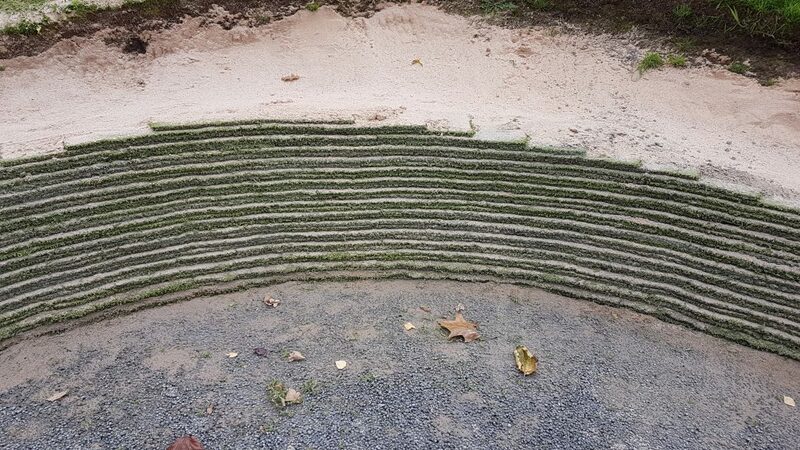 Have the new bunkers met the satisfaction of the members and your team and would you recommend Capillary Concrete as a bunker liner to other clubs? The members are happy with end result as the sand remains playable in all weather. It is a product I would have no hesitation in recommending as we have had, and are having, good success. What height of cut do you use across the course? The greens are cut daily, April to October, at 4mm, going as low as 3.5mm for certain competitions. The winter height of cut is 5mm. The tees are cut twice a week at 12mm, or 10mm from May to September. This is the same for collars and aprons, using the same machine. Fairways are cut twice a week at 14mm from April to October and through winter at 16mm. The rough takes four days to complete the cut – at 60mm from March until the growth subsides in November. The semi-rough is cut to the same schedule as the fairways – at 28mm. The course was reshaped in 1991 and 7,000 trees were planted across the course in 1994. Have these grown to deliver a positive or negative effect and what tree management plan do you currently have in place? Following the reshaping of the course due to a proposed road, the trees were planted to help shape and define the course. More than 7,000 trees were planted with a failure rate expected of 30 per cent, however we have probably seen a success rate of more than 90 per cent. In general this has helped in terms of course definition, however a major woodland management programme is now required and currently under discussion. This is not easy as for some reason many people are against the felling of trees so some educating of golfers is required. 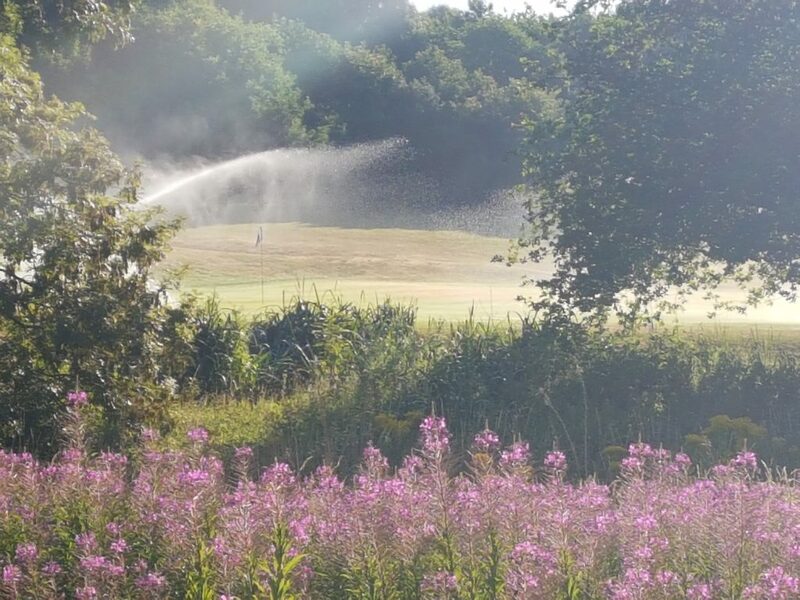 What irrigation system does the course currently use and how did you cope with the hot summer? A new ring main was installed by Osprey, very successfully, in 2011. And Hunter pop ups were installed while split valving the greens – no water to tees or fairways. The system is currently overseen by North Staffs Irrigation for start up and shut down. Water is obtained from an onsite lake where we take 20 cubic metres per day, as allowed. However, we do have an abstraction licence for 70 cubic metres per day from a tributary river but unfortunately that’s currently not working due to a damaged pump and access problems. This summer was very challenging as we are on USGA spec greens and couldn’t get enough water to them but overall through great team support and regulating water application, we have survived well. 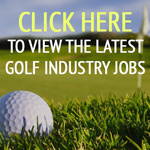 Do you think your initial role as an assistant golf professional helped you shape your greenkeeping career? The knowledge of the game and dealing with the golfer on a daily basis while I was an assistant pro has helped greatly in my understanding of what the golfer requires and demands. However, it’s not always achieved with the modern golfers’ demands. Also, as I was a reasonable player, it reduces the ‘what do you know, you never played the game’ scenario. You‘ve said that when you started in this industry you believed golf was a game that was above society and the expectation was for golfers to raise their standards, but now golfers believe they are perfect. What has driven this belief? The massive general decline in the attitude and etiquette of the golfer. Many golfers no longer have the knowledge of the rules of the game and are rarely shown or taught general etiquette. Pitch marks are left, divots are not replaced, bunkers are left in a mess, signs are ignored to name but a few. All with the attitude of ‘that’s the green-staff’s job to sort out’. I think a lot of this is down to the governing bodies who, in their quest to make golf ‘available to all‘, have not promoted this side of the game. Also, as clubs experience a decline in membership there is more emphasis on quantity, not the quality, of golfer. Dress codes are not followed and at times some of the clothing worn looks like a circus is in town but then, as I am told, I am too traditional and somewhat of a dinosaur! What I would say is the proof is in the end result. You’ve had a regular column in a local newspaper for the last six years. How did this come about, what do you enjoy about writing features and what do you look to achieve in doing this? Mike Davie: I was asked if I would like to contribute a monthly article following me being overheard discussing bunkers with a golfer in the club car park. I only write in defence of the greenkeeper and try to write informatively so I can educate golfers, if possible. I won’t say how, when or what to do as I don’t want other chairmen or committee members of other clubs telling their head greenkeeper that Mike Davie says this, and cause confrontation. I believe it’s horses for courses and there’s more than one way to skin a cat. I do enjoy writing the article and hopefully I put the plight and difficulties of greenkeeping into golfers’ minds. What machinery fleet are you currently using? Can you outline your fleet and equipment? Our fleet is a mix of John Deere, Toro and Baroness. We don’t have the biggest fleet in the land but manage due to the diligence of a visiting mechanic who comes on a weekly basis to maintain the fleet. We are currently trying to reinstate a five year rolling stock replacement programme which we lost due to the budget cutbacks we had in 2007. We currently operate with a seven-year-old John Deere 2500E as a greens’ back up. We use a three-year-old Toro 3250-D for the greens. A Toro 3100-D for aprons. A John Deere 7700 for fairways. A John Deere 8800 mower for the rough. A four-year-old Baroness LM283 for the semi-rough. An 11-year-old John Deere 495 is used around trees. We also have a 10-year-old-plus Imants Shockwave and two John Deere tractors, one with a front loader and a 400 litre tank Team Sprayer. How do you personally engage and communicate with the membership? I try to speak to members, those willing, and have a good relationship with and support from the chairman of green, who corresponds frequently with email updates to membership. I also communicate through the pro shop and keep them informed. We also have a very active member working party who do tasks around the course, who pick up information and realise some of the problems and communicate back through the club. As you move around the course daily, what are you most satisfied and proud of and what have been the highlights of your career to date? In general I am proud of what has, and is, being achieved. The course, as stated, was dug up in 1991 and I have grown it in plus been involved in other reshaping and continue to try to develop to match the modern game. I am proud that five of my trainees have gone on to be head greenkeepers at other courses and my current team have great potential as well. What changes do you think need to be made to benefit the industry sector and profession of the greenkeeper? I feel more support is required by the greenkeeper and that the associations and governing bodies need to get on board with our welfare, not just bang the education drum. Many clubs are not interested in educating staff and just want cheap labour to sit on a seat and cut grass. Our professionalism is currently being undermined and undervalued. What advice would you give to young greenkeepers wanting to advance? Work hard and enjoy. Accept that you can’t, and won’t, please everyone but go to bed at the end of the week knowing that you have done your best with the resources available. Remember: The brain is our most powerful, hard-working organ. It works 24 hours a day, seven days a week, 365 days a year, from the moment you’re born until the moment you take the clubs out the boot of the car.